The posts shown in this circulating saying Adidas is giving away free pair of shoes to celebrate its 93rd anniversary are fake. It may make you install a possible Malware. Please refer to the verification section of this article for more details. Adidas is giving away 3000 Free Pair of Shoes to celebrate its 93rd anniversary. 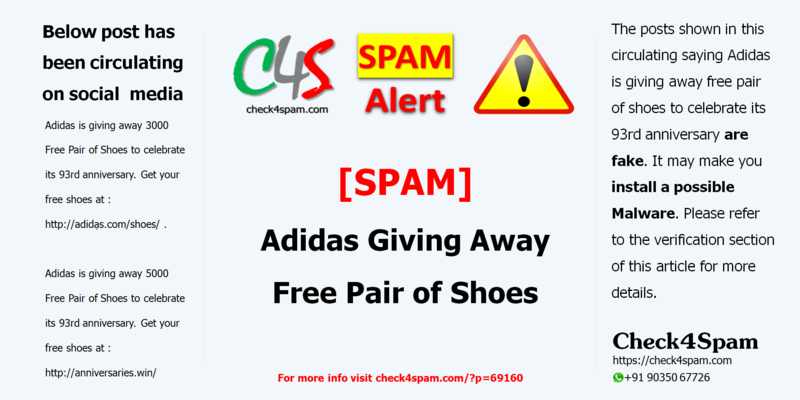 Get your free shoes at : http://adidạs.com/shoes/ . Please note that the in the link one of the a’s in adidas is ạ and so its not from real adidas.